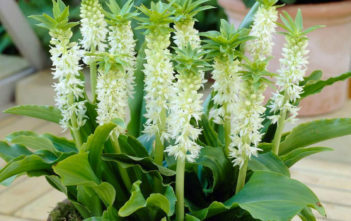 You are at:Home»Archive for "Eucomis"
Eucomis is a genus of flowering plants in the family Asparagaceae, subfamily Scilloideae, native to southern Africa. Most species of this genus are commonly referred to as Pineapple Flowers or Pineapple Lilies. 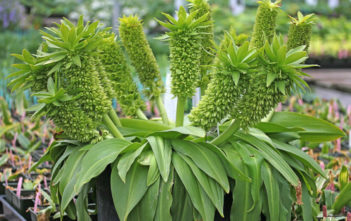 The name “Eucomis” is of Greek origin, “eu-“, meaning “pleasing” and “kome”, meaning “hair of the head”, thus referring to the tuft of leaf-like bracts that crown the inflorescence of the species in this genus. 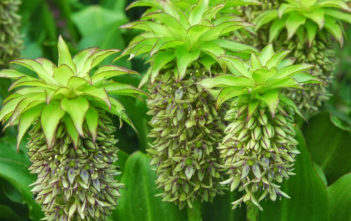 Eucomis is native to South Africa, Botswana, Lesotho, Swaziland, Zimbabwe and Malawi. Species can be found in grassland, forest, swamps and on river banks, but are absent from the drier regions.